Conventional garden hoses are bulky and can be difficult to deal with in your outdoor space. Plus, they take up a lot of storage room. A retractable hose can help you work around your outdoor space without dealing with a frustrating hose that gets tangled and in the way when you try to use it. Retractable hoses are ideal for use in small yards where storage is limited. They can also be used in large spaces. A retractable hose can be wound up compactly for storage. They are also much easier to use as they don’t tangle and they don’t weigh nearly as much as conventional hoses. They come in many different lengths so that you can find the best option for your particular yard. The following is a list of the top 10 best Retractable Garden Hoses in . This expandable garden hose is 50′ long when stretched out. The hose comes with a convenient reel that allows you to roll and unroll the hose easily. It also stores compactly when rolled onto the reel. The hose is made of durable materials with a high-stretch outer fabric that is flexible and able to give as needed to prevent leakage. The hose is designed of a material that doesn’t kink or tangle to prevent frustration while in use. It comes with a high performance sprayer that has several different spray settings for many uses around the home. This hose has brass fittings and an on/off switch for changing the nozzle. 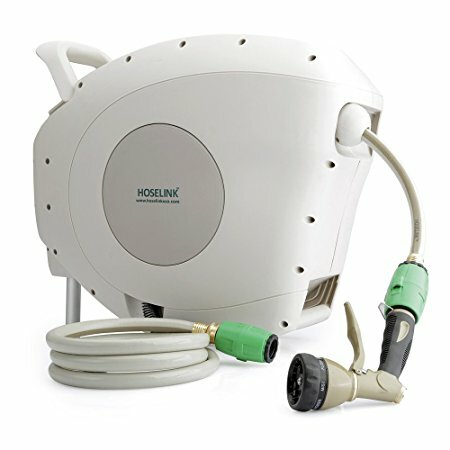 The Hoselink retractable hose with reel comes with an 82 foot hose and a metal spray gun with 7 different spray options. This hose has a smooth pullout and rewind function to save time and effort when working out in your yard. This system comes with a 180-degree swivel wall bracket for convenient installation options. 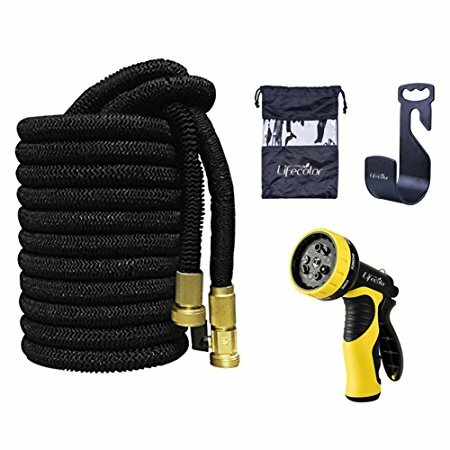 This retractable hose from Hoselink is made of quality reinforced 9/16″ hose with brass fittings for a secure and leak-free connection. The device also has a stop anywhere locking mechanism that helps prevents kinks and knots in the hose while you’re using it. 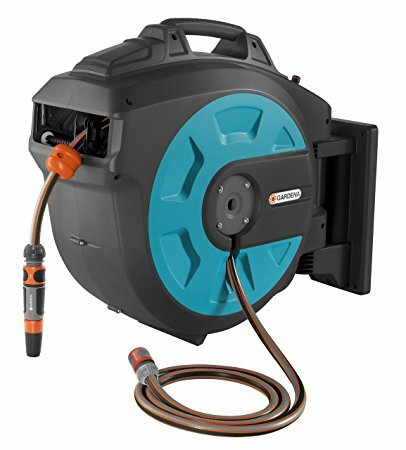 The GARDENA retractable hose is 82 feet long. This hose has an easy to release lock that pulls the hose in when you’re done with it. The device requires no cranking. The winding box has a powerful spring that also helps to prevent twisting and tangling of the hose during the rewind process. This hose from GARDENA comes with a hose guide bracket that allows you to mount it on the wall or do a corner mount for convenience. This hose box can be removed as needed for storage during the cold weather to protect it from the elements. The FOCUSAIRY water hose is 25 feet long when fully expanded. This hose can retract to 8 feet for compact storage. It allows for at least 8.55 bar of water pressure to work well for many different needs around your outdoor space. The hose comes with a 9 pattern nozzle. 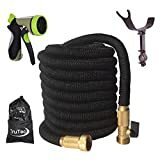 This hose is made of durable materials and it has brass fittings for tight, leak-proof connections. The hose comes equipped with a built-in shutoff valve to save trips to the faucet if you need to cut the water off. The hose is made with a triple layer material which is designed to last through many uses without holes or leaks. This expandable hose from VicTsing can be expanded to up to 50 feet when filled with water. The hose shrinks back quickly once the water is drained out. It has solid brass fittings for secure connections that don’t leak. The brass valve also has an on/off control so that you can control the water without having to walk back to the faucet. This durable hose is made with a 100% polyester cover that is designed to last. The hose has a natural latex core that can hold up to being dragged and pulled through the yard. It’s also lightweight and portable so that you can easily move it around the yard as needed. The Lifecolor expanding hose can expand up to 100 feet to work for many gardening needs, even in large yards. This hose comes equipped with solid brass connectors that are designed to connect securely and prevent leaks, helping to conserve water and maintain water pressure. The hose is made of durable materials that can withstand extreme temperatures. This hose from Lifecolor has a 100% natural latex core that is resistant to tears or holes. It comes with a nozzle that has 9 different spray options. The hose is able to withstand high pressure and the stretchy polyester cover is durable and lightweight. 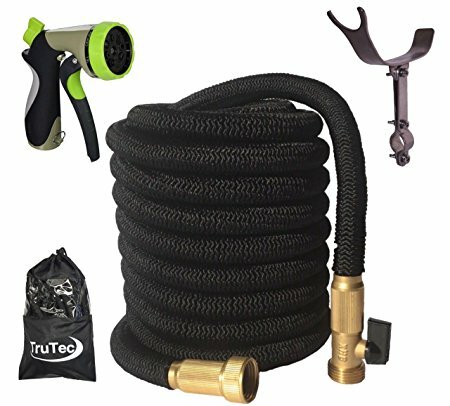 The TruTec expandable garden hose is 65 feet long when fully expanded. It comes with a spray nozzle that has 8 different spray patterns. This hose is made of durable materials and has a triple layer latex core. The outer 48 ply fabric is flexible to prevent kinks and tangles while the hose is in use. The hose from TruTex comes with a compact stainless steel holder that allows you to install it in many different places. The hose comes with 2 spare rubber washers for a tight connection that doesn’t leak. 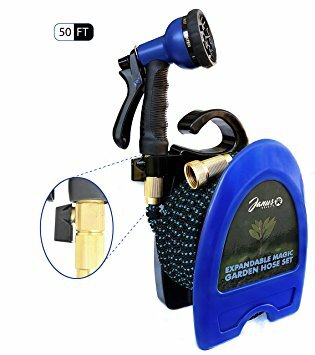 The included nozzle has an ergonomic non-slip handle that allows you to easily use the hose for all your watering needs around the home. This garden hose has a double layer latex core for extreme durability and resistance to tears and leakage. The hose also has brass fittings for a secure fit to save water and maintain water pressure while the hose is in use. The extra strength fabric on the outside of the hose makes for long-lasting watering options for your yard and garden. 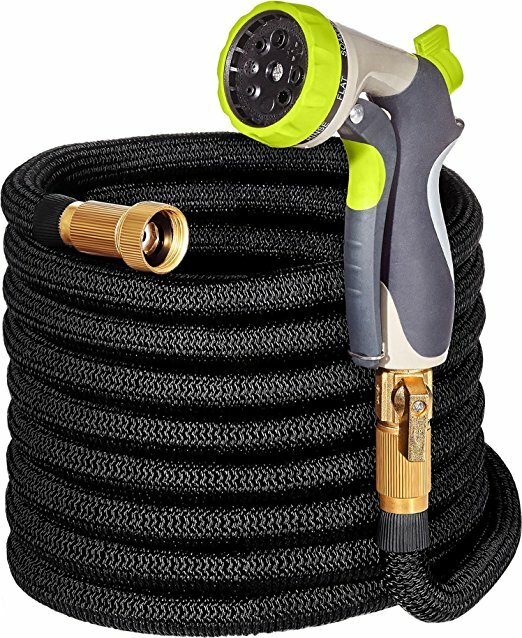 The 50 foot garden hose by Hospaip comes with a nozzle that has 8 different spray functions. The hose expands from 17 feet to 50 for easy use and storage. It can be used in cold or hot temperatures and is able to withstand a water pressure of 3-12 bar. 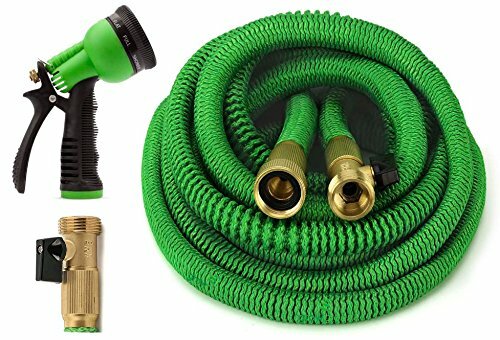 The heavy duty expandable hose from GrowGreen comes with a convenient storage sack to keep the hose accessible whenever you need it. The hose has a unique design that prevents it from tangling, kinking, or getting into knots while you’re using or storing it. This hose easily expands to the full length under normal water pressure. 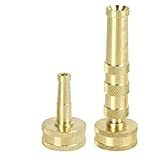 This expandable hose has a solid brass connector that is designed to prevent leaks at the connection. The hose comes with a shutoff valve so that you don’t have to run back to the faucet to turn it off. It starts at 17 feet and expands to 50 feet at full length. 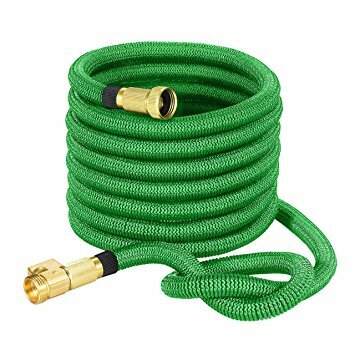 This expandable hose from GrowGreen expands up to 25 feet and is ideal for small yards and gardens. 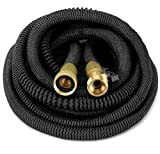 The hose has a strong latex core and extra strength fabric for protection on the outside from punctures, rips, or tears. This hose comes with a spray nozzle that has 8 functions. 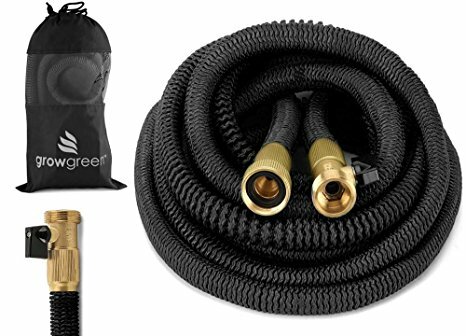 The GrowGreen 25 foot hose has all brass connectors for secure and leak-proof connections. The connectors are also resistant to corrosion. The hose is 8 feet in length when not expanded making it ideal for storage in small spaces. An expandable hose can make working in your yard or garden quick and easy. These types of hose don’t tangle or get kinks like traditional hoses. They also tend to be much lighter weight and easier to move around your space. Most of them can be stored compactly when not in use and can easily be put away in the off season for those who live an areas with cold weather. When shopping for an expandable hose, you should look for one that has quality connectors, a durable inner hose, and an outer layer that can protect the hose. It can also be useful to find a hose that has its own cutoff valve to save time when you’re working outdoors. 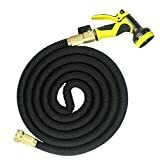 You can read reviews from others who have purchased the hose to find one that is made well and is a good buy for the money.